The Black Mass Sabbath Pulse presents an even stronger and more confident vision from this unholy duo. In many ways, the rough-around-the-edges Initiation to Obscure Mysteries could've been a lost demo from the Greek black metal scene circa 1992; by comparison, The Black Mass Sabbath Pulse is the bold and bright step made by legends like Rotting Christ and Varathron when they recorded their respective debut albums. The same rudiments remain - pulsing, arcane mysticism and epic heavy metal might, now daubed more heavily in mysterious synths - but here, ITHAQUA display a deeply seated understanding of what made early Greek black metal so majestic and are now able to put their own distinct stamp on such. Of the two songs, the A-side title track is indeed a pulse of Black Mass, windswept and infinite, thoroughly hypnotizing in its hammering surge; meanwhile, on the flipside is "Walpurgis, The Flight of Spectral Witches," which is a winding travelogue across magickal autumnal nights, lurking about before taking climactic flight. 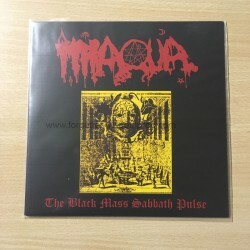 The growth between ITHAQUA's demo and their first EP is not inconsiderable: the potently occult atmosphere and simple-yet-unforgettable riffery remain, but the band are truly now on the path to greatness with The Black Mass Sabbath Pulse.